Vintage Marine has been doing quality restorations since 1979. We take great pride in our workmanship and our attention to details. No project boat is too difficult. From gray pattern boats to structurally sound hulls, we have restored all boats from all levels of disrepair. Loose leaky bottoms can be readily replaced with a new bottom. 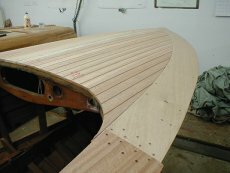 Typically, we double plank our bottoms using marine grade plywood for inner bottom and mahogany plank for outer bottom. We seal the bottom with 3M-5200 which provides excellent strength and durability, especially for boats with more powerful modern power plants. While the old bottom is off, we inspect the keel, chines and frames for damage. Rotted or weak wood is always replaced or repaired where applicable. On restorations that require replanking of the sides or decks, we resaw our mahogany to match on both the port and starboard sides of the boat. 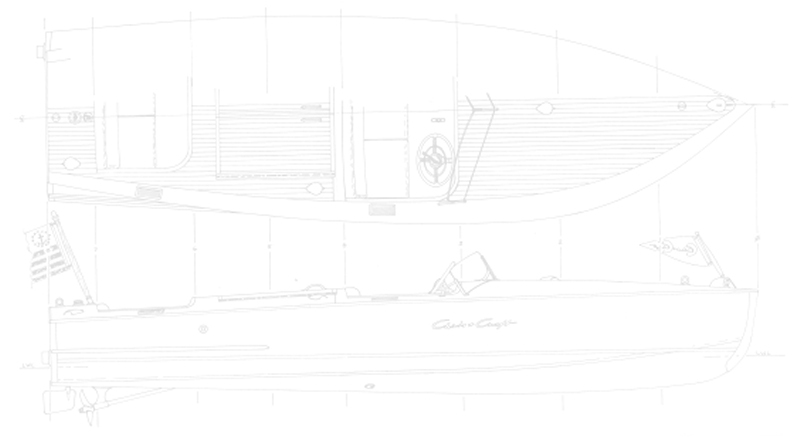 This is known as "book matching" and often makes a difference on show quality boats. Grain patterns are a mirror image. We take great pains to match the original stain color of the boat, making sure that the coverage of the stain is even along the entire hull. Using only the finest quality varnishes like Z-Spar, Epifanes and Interlux, we finish the boat until it looks right - no matter how many coats it takes. The final product is a gleaming boat, and a dust free highly reflective finish. While most modern varnishes have a UV protectant built in, we recommend maintenance varnish every couple of years, depending on use and storage variables. Vintage Marine continues our high level of attention to detail t hroughout the interior of the boat as well. Hardware is rechromed, gauges restored, bilge paint matches original factory type. Wiring is done with antique style cloth covered wire. Upholstery is replaced as original, and at the customers request, we often substitute naugahydes for leather for durability and wear. Flooring is replaced as factory spec as well. Need to bring your classic back to life? We are always happy to discuss our restoration work. Many of our restorations have received awards at boat shows up and down the East Coast. Give us a call or stop by the shop to see how we can make your boat a show winner too.